The common cairp, European cairp or simply cairp (Cyprinus carpio) is a widespread freshwatter fish o eutrophic watters in lochs an lairge rivers in Europe an Asie. The native wild populations are conseedert vulnerable tae extinction bi the IUCN, but the species haes an aa been domesticatit an introduced intae environs warldwide, an is eften conseedert a destructive invasive species, bein includit in the leet o the warld's 100 warst invasive species. It gies its name tae the cairp faimily Cyprinidae. ↑ 1.0 1.1 Freyhof, J. & Kottelat, M. (2008). 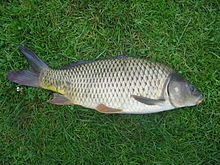 "Cyprinus carpio". IUCN Reid Leet o Threatened Species. Version 2013.2. Internaitional Union for Conservation o Naitur. Retrieved 6 April 2014. This page wis last eeditit on 1 Apryle 2017, at 16:08.